We are Odd Two Out Publishing, a new imprint with big plans. Over the coming years we hope to become the science fiction community's essential source for books, magazines and more. Odd Two Out aims to promote the unusual and the interesting, we're looking for material that's intelligent and challenging but we don't think that should mean that we can't have fun too. Who writes sf and fantasy? How do they perceive their work, and how is it received? The two surveys collected here answer these questions, and many more. 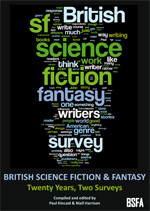 With in-depth responses from over 120 writers, and detailed analysis, Twenty Years, Two Surveys offers a comprehensive view of the state of British science fiction and fantasy, and charts the changes that have taken place in the field over the last twenty years. Edited by Paul Kincaid and Niall Harrison, this book was published by Odd Two Out on behalf of the British Science Fiction Association. Odd Two Out is continuing to work to produce new books and publications that grab the reader's attention and deliver new takes on genre publishing. We hope to have news of some major projects to announce over the next year. Odd Two Out is a brand new venture but it's based on fifteen years experience in publishing and magazine production. We aim to deliver great quality stories to readers at a reasonable prices. Odd Two Out has plans to publish books and magazines - but we'll also be exploring the potential of the new media. ODD TWO OUT? Sounds like a silly name? Maybe. But just because you're in the minority it doesn't always mean you're wrong. Design adapted from a template by Luca Cvrk.